Life is hard. Life is unfair. Not just for you. But for everyone around you. Some show it, some don’t. Some keep stashing it in there, some let it out – they cry it, talk it, write it, sketch it, drink it. … You may have lost your love. Or is it your family? Sunk your fortunes, I dare say? Oh poor chap! Is it a broken heart? There are seemingly endless possibilities to your struggles. Some of us struggle to live. There are others who struggle to die. Some struggle to love. Others struggle to be loved. Some fail despite riches. Fact is we all struggle. Don’t ever think you’re alone or you’re broken beyond repair. There are others in the same boat as yours or even worse! Yet they go on living. And learning. The girl sitting beside you with that beautiful smile? She may have seen worse times than you did. That guy at work who seems to be successful in all that he does? Maybe he works twice as hard as you do just to keep a house running. We all have struggles. Some bigger, some smaller, but none comparable. What troubles your soul is a struggle for you, irrespective of what I would term it as. That neighbour with a lavish house and a decent job would, maybe, be “struggling” to find love. That’s his struggle. Don’t demean it by pointing out that he isn’t valuing what he has. He is probably valuing it much more than you would. People will fail. We fail to live up to our standards. Or that of our parents. Or mentors. Or society, at large. Some of us get up again. And again. And again. To keep trying. And then we let it go after a point. Not because we’re quitters or failures. But because we realize that we’re killing ourselves each day by drowning in the sorrows of trying and failing each time. And we don’t deserve to do that to ourselves. There is another thing we do. We learn. We learn from our mistakes and we make sure that the people around us don’t commit the same. Everyone helps friends. But some of us even go to the extent of helping our disparagers. Our losses change our perspective on life. We start valuing the ones around us more. We appreciate the abruptness of life. We empathise rather then pity. We laugh more than getting offended. We accept that life will go on. And that either we can choose to move on with it or complain about how the world left us behind. I have met such wonderful souls along the way who wake up with a smile each day to face the troubles they’d slept with the night before. I have met weary travellers who will light up like the Sun to shower you with a kind word or two! There are people who will know all about your troubles but never give you a hint of what they’re going through, because they know you need help first. These souls are so beautiful inside that the outside stops mattering. And one of them is what I’d truly like to be! To all those who think I am writing about you, yes I am in fact writing about you. And thanking you for inspiring this post. And my life. Previous PostComing Soon : Pill to erase specific memories!Next PostSpreading love. One of her best sayings! We all struggle, we all fail, but this world also has many many great people who are willing to offer you a helping hand. Well said 🙂 and I totally agree with you. Thank you! 🙂 Good to see you drop by! “Our losses change our perspective on life.” Such a valuable truth! I guess losses can become our best friends, though always with a bitter edge! 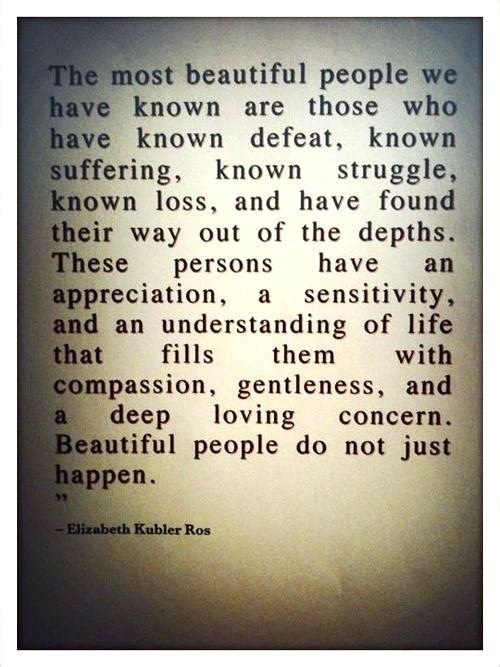 Our losses help us become better, though they shouldn’t necessarily define who we are.